Bandai Namco Entertainment America began streaming three character move set videos for its upcoming One Piece Burning Blood PlayStation 4, PlayStation Vita, PC, and Xbox One game on Friday. The videos preview the move sets for Akainu (Sakazuki), Kizaru (Borsalino), and Aokiji (Kuzan). The company previously streamed moveset videos on Wednesday for Whitebeard, Marco, and Joz. Confirmed playable characters in the game include: Luffy, Doflamingo, Fujitora, Law, Kuma, Brook, Chopper, X. Drake, Enel, Crocodile, Ace, Sabo, Kuzan, Smoker, Captain Kid, Zoro, Sanji, Usopp, Franky, Boa Hancock, Nico Robin, Nami, Perona, Akainu, Kizaru, Aokiji, Whitebeard, Marco, Jozu, Jimbei, Luffy (two years ago), Sengoku, Shanks, Koala, Marshall D. Teach, Jesus Burgess, Bon Clay, Ivankov, Buggy, and Gekko Moriah. The game shipped in Japan on April 21 on the PlayStation 4 and PlayStation Vita only. The game will ship for PlayStation 4, PlayStation Vita, and Xbox One on May 31 in North America and June 3 in Europe. The digital PC version will launch in June. 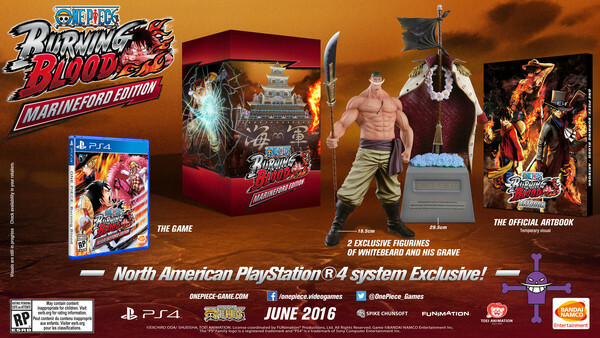 The North American version of the game will have a Collector's Edition, which includes the game, two figurines of Whitebeard and his grave, and an official artbook. It will only be available for the PS4 version of the game. Europe will also have a "Marineford Edition," which includes the same items as the North American Collector's Edition, but will be available on both the PS4 and Xbox One versions of the game. Those who pre-order the game in North America and Europe will get an exclusive metal case, as well as codes for Afro Luffy, Kung Fu Luffy, and Luffy Gear 4 as playable characters. Bandai Namco Entertainment will also release the game in Latin America in 2016 for the PlayStation 4, PlayStation Vita, and Xbox One. Bandai Namco Entertainment plans to release the game in 12 languages: English, French, Italian, German, Spanish, Russian, Polish, Brazilian Portuguese, Neutral Spanish, Traditional Chinese, Korean, and Japanese.